Used Volkswagen Tiguan Review - 2007-2016 | What Car? 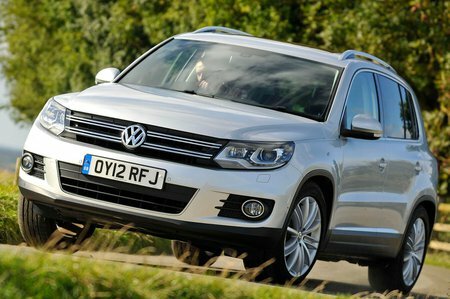 What's the used Volkswagen Tiguan estate like? The Tiguan might not be the sort of car to shout its name from the mountain tops but it holds a special place in Volkswagen's motoring history: it was the firm's first compact SUV and catapulted it into the competitive marketplace dominated at the time by the Nissan Qashqai. It actually sits atop the platform of the contemporary Golf and manages to combine all the practicality and flexibility expected of an SUV while still holding onto VW's strengths of quality and refinement. The Tiguan was launched in 2007 and facelifted in 2011, and the range is quite complicated, with later models spread across four trims: S, SE, R-line and the special-edition off-road Escape with revised bodywork to improve approach and departure angles. There's the option of four-wheel drive on all models bar the entry-level diesel engine. There's a range of engines available. Petrol units range from a 158bhp 1.4 to a 177bhp 2.0 and end with the 207bhp engine used in the last-generation Golf GTI. But, perhaps not surprisingly, the vast majority of Tiguans are diesels. Presciently, VW offered three versions of the same 2.0-litre motor – a 108bhp for the entry-level S trim, a 138bhp variant available in all models and a 174bhp range-topper only for SE and R-line customers. Escape trim was available with only the 138bhp version. Inside, the smart interior has plenty of room for up to five and rear seats that slide to favour leg room or boot space. At 505 litres, the boot isn't the biggest, but it's a useful, rectangular shape without awkward intrusions. Drivers sit low, giving this SUV a hatchback-like feel, and the dashboard is logically laid out and built from high-quality materials, as you'd expect. All models come with decent safety kit, including stability control, side and window airbags and Isofix child seat mounts. On the road, all the engines offer the refinement expected from most modern VW cars, with the petrols in particular being smooth and quiet, if not uproariously quick. That said, the superior fuel economy of the diesel cars means most will overlook the petrols. The diesels are smooth at a cruise, if a little gravelly low down, with all of them offering reasonable performance – although the 138bhp version strikes the best balance. A fairly slick six-speed manual gearbox is fitted as standard to all engines, although all have the option of a DSG automatic transmission. This can be a little hesitant and jerky, though, especially around town. While the stiff suspension brings a slightly unsettled ride at lower speeds, it settles down nicely as the speed increases to become a relaxed and composed cruiser. It handles safely, if in a totally uninspiring manner. The same is true of the steering, which is well weighted and fairly accurate, but offers little in the way of communication to the driver. So the Tiguan has a strength and a quality that pervades its entire structure, and this helps lift what is a rather dull driving – and potentially owning – experience. Find a good one, though – and there are plenty now available – and what you'll have is a solid and very practical car.